You might say I have a problem. Or a bottom-less bank account. One of these is true. My problem is, I apparently get a thrill out of simultaneously exhausting and embarrassing myself. But... only after I've handed a chunk of my paycheck to one of the largest corporations in the world and voluntarily set my alarm to ring at 3am on a Saturday morning. Don't get me wrong -- I've never showed up at a nerd convention wearing a homemade Mega Man costume made intricately out of blue tinfoil gum wrappers I've accumulated since 1987. And an option for the future. There's just something thrilling about imagining a costume, bringing it to reality, and then... running in it. I dunno. Maybe I just feel like I'm in a parade. 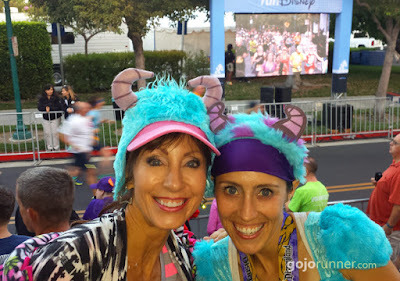 And I especially love it at Disney races, because everyone gets in the fun. Admittedly, my costumes haven't always worked out, unless you count "clueless girl lacking all sense of fashion" to be a successful costume. 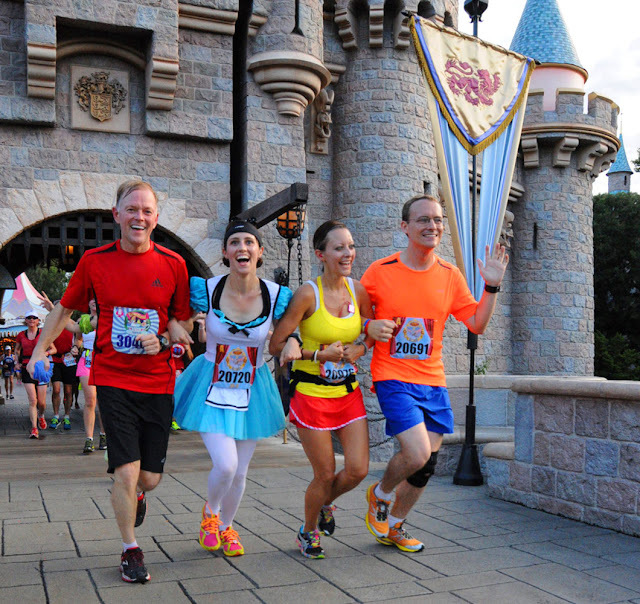 But I've found that the key to making a good running costume is to make sure you can do exactly that in it -- run. Or at very least, walk. That means layers must be thin, sweat-resistant, and breathable. It also means you only need to design a costume that reminds people of a character or object. Sometimes simple is better. A simple red and white polka-dot tank and some mouse ears turn you into Minnie Mouse, without the unnecessary layers of black fur and yellow heels. Because, again, you have to run in it. That whole "running" thing comes with signing up for a race. For instance, you wouldn't want to run in a thick padded gray sweatsuit with a 5-foot trunk and ears mimicking a pterodactyl wingspan and call yourself Dumbo. People would just strip you of the letter "o." I once saw a full-plush Pooh Bear running the Disneyland Half marathon, and medics were clearly keeping a close eye on him. 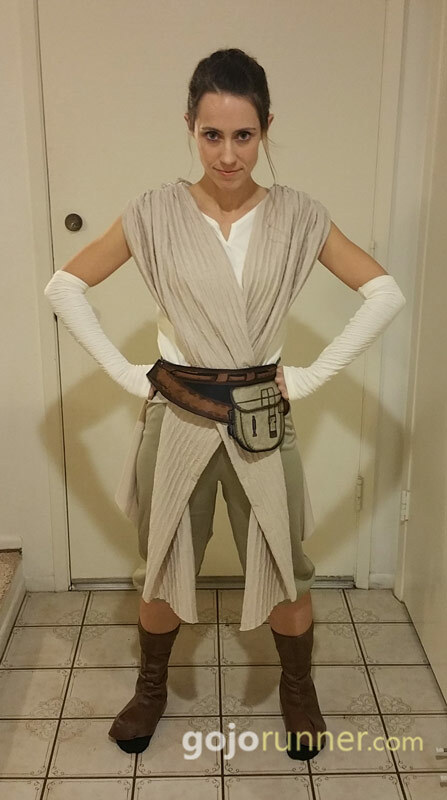 From the moment I saw The Force Awakens, I decided that I wanted to forsake my life and just be her. That's not too much to ask, is it? Exchange my truck for the Millennium Falcon, and my jogger mace for a light saber? My husband (left) started a new Jedi fashion trend with his Peter-Pan-style cut-offs. I was low on time before this race, so I purchased a Rey costume on Amazon, which came with the awesome shorts, top, sleeves, and cheesy-but-whatever belt/pouch imitation. But when it arrived in the mail, I realized it only came with criss-crossed material on the front, and was nothing but a white t-shirt in the back. 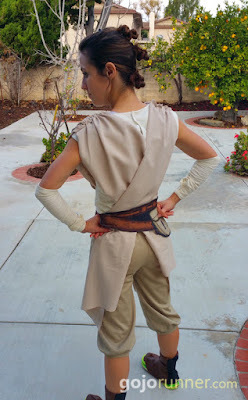 So I sewed criss-crossing material onto the back, added brown pirate boot covers that I folded and pinned down at the right height, and put my hair in three buns -- or tried to, at least. It was great to run in. While the crossed material added a little weight, I hardly noticed. The rest of the material was thin and light, and I'd be lying if I didn't say I felt just a smidge awesome wearing it. Our bathroom is the only well-lit room at 3am. Don't judge. So I had a dream that I ran a full marathon, and I pushed myself so much harder than I should have (half-way point time: 1:32) that I tore my hamstrings. I might as well have been wearing a grey sweatsuit, trunk, and ears. 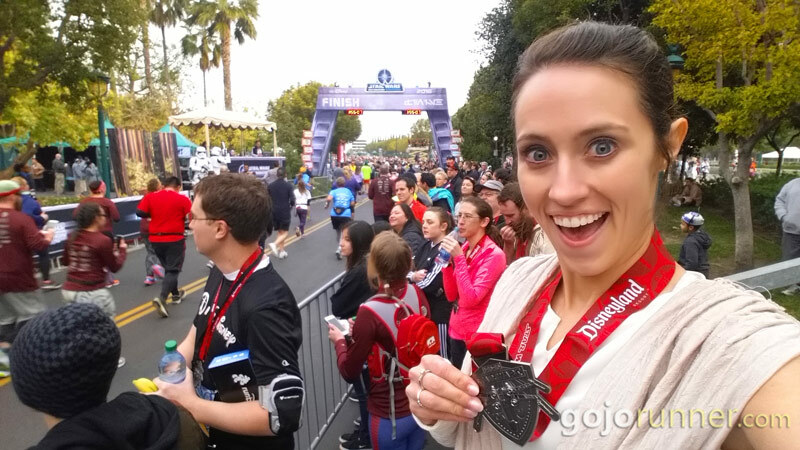 In fact, I tore my hamstrings exactly one week before this 10K, but having already dropped a hundred bucks on an entry fee eight months prior, I was gonna finish this magical race, dang it! I painfully limped and hobbled my way through the course, coming in with the slowest 10K finish time I've ever had, and probably contributing to my 8-week forced running hiatus afterward. I got more cheers than ever before, though. Pity cheers are still cheers. 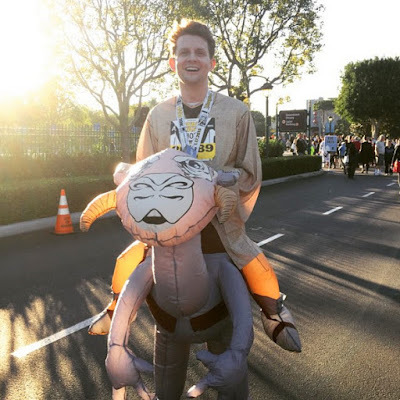 I bought this costume on Amazon for like $20 or something. 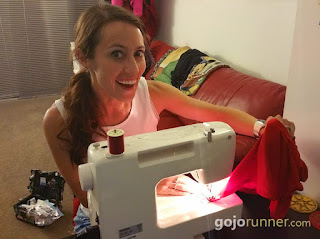 It came with a little jacket that I discarded, and then I shortened the straps to pull the bodice up, and added the race capris and headband, and it was completely comfortable to... hobble in. My husband even sported up a Star Lord costume, though he had to leave the mask at home. I was higher on pain-killers than I was on picture-taking for this race, so you just get pre-race bathroom pics. Sully was another modified cheap Amazon costume. 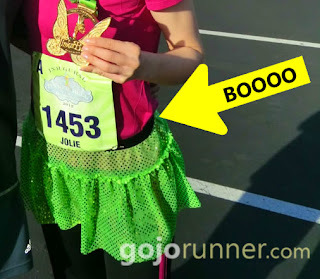 It originally came with a wool hat that I replaced with a headband, and I modified the leggings and sewed on the velcro tail so they would stay on during the race. It's a lot thinner than it looks, but it did warm up a bit more than tech material would have. Otherwise, it worked out great. Mom flew in from Utah and sported a matching hat in support! Any true Disneyland fan will hopefully recognize what I was going for here. 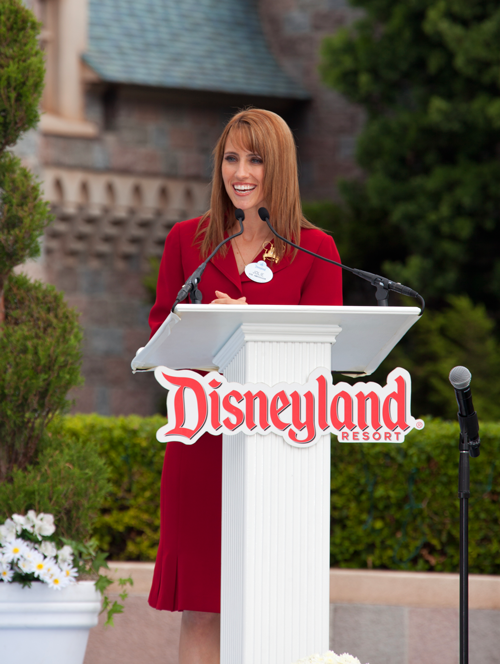 Ever been to Disneyland and seen the tour guides who work at the park? Back in 1965, there was a Disneyland tour guide who was selected to be the spokesperson and host of Disneyland to the World. Her name is Julie Reihm, and she became Disneyland's first Ambassador. She was later named a Disney Legend. 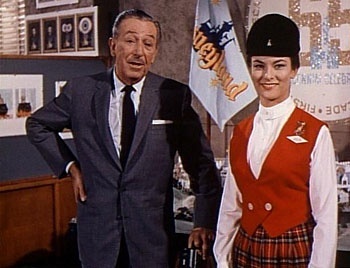 Julie with Walt Disney on his show "The Wonderful World of Disney" in 1965. After she served a year-long term, one or two new Ambassadors have continuously been chosen each year or two to represent Disney. For 2011 and 2012, I was one of those lucky people. I served as a Disney Ambassador for 2011-2012. Disney had clearly lowered their standards. This race was a special one, because some of the former Disney Ambassadors wanted to get together and speed walk the course. Eight of us showed up and got our butts handed to us by 1966 Ambassador, Connie, who can apparently speed walk at an Olympic pace. Personally, I think speed-walking might be harder than running. 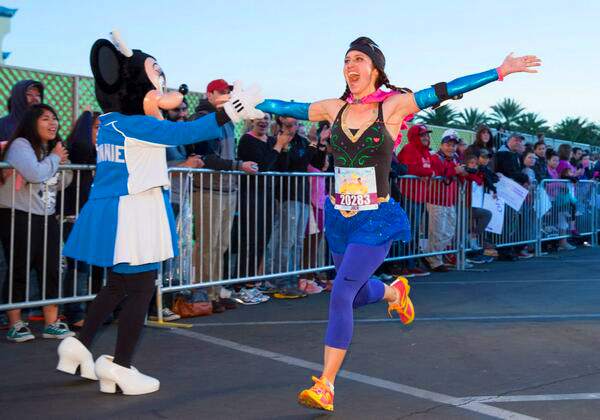 Who knew Disneyland's second Ambassador ever was a champion speed-walker? 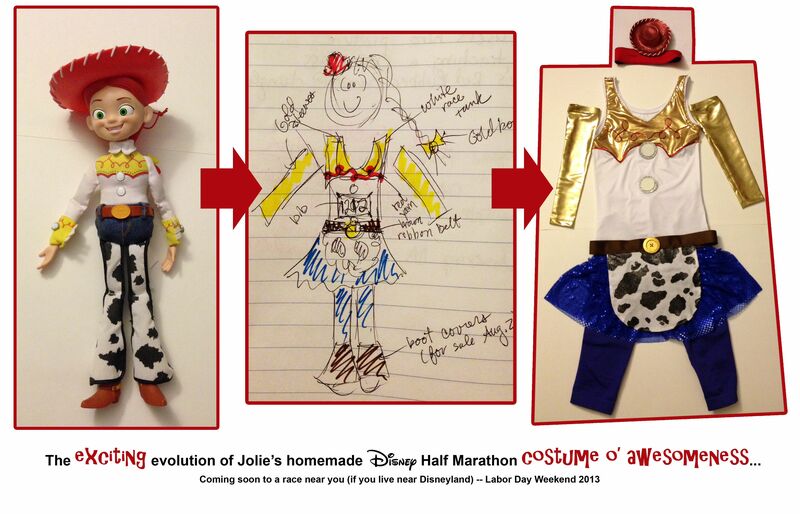 So for this costume, I wanted to make a running version of Julie Reihm's first Ambassador / Tour Guide costume. I modified a red tech tank into a vest, purchased a short plaid skirt from a lingerie boutique, added a couple white sparkle sleeves from Sparkle Athletic, some red knee-high socks, and topped it off with Mary Jane shoe covers, a "Julie" nametag and pin, and a rider's hat I made by overlaying a styrofoam ball with blue velvet. This mess eventually became the hat. I wanted to stylize a running version of a Jedi costume, since actual Jedi robes are as good for running as the pope's robes. For this one, I started out with a white V-neck tech tank, sewed some thin criss-crossed tan material to the front (no need to do the back on this one), and added a gold sparkle skirt from Sparkle Athletic for that female flare. I bought some cheap leggings from eBay and some pirate boot covers from Party City. Then I added a hair piece and padawan braid... since I actually already own one of those. For the outer robe, I cut down the front of an XL men's brown tech shirt, and then cut and took in the back, keeping its baggy sleeves and length, but minimizing its width. It's covered in awkward stitching, but no one can see that at the race, so who cares? Once the robe was done, I stitched it to the bodice, so the top is actually all one piece. My husband and his tauntaun were featured on BuzzFeed. 6.2 miles riding on a tauntaun turned some heads, though some say it was cheating to make the animal do all the work. I'm glad he brought the tauntaun that year, because tauntauns were outlawed with the 2016 costume rules. 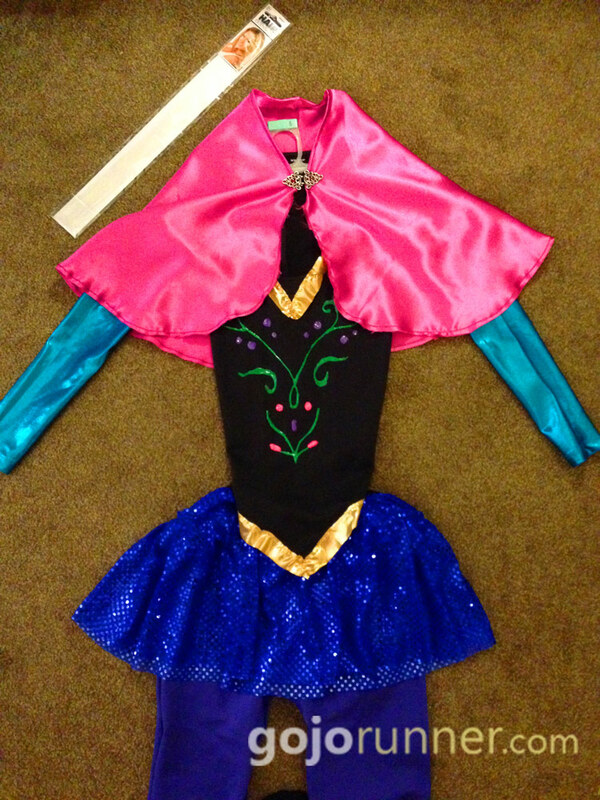 For the record, I made this costume when Frozen was new and not overly played out. Inspired by Anna, who I feel matches my clumsy side pretty impeccably, I hand-stitched a gold trim to a black tech tank, then used puff paint for the front design. I made the cape from scratch -- I just bought some lightweight material and kept cutting and sewing until it... "worked," and then added teal sparkle sleeves and a blue sparkle skirt again from Sparkle Athletic. 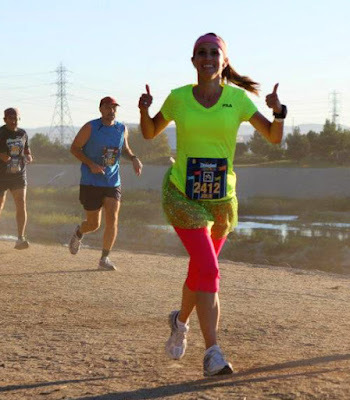 Topped with braids, a white hair streak from the party store, and blue capris so as not to blind the world with my legs, and it was time to hit the race. 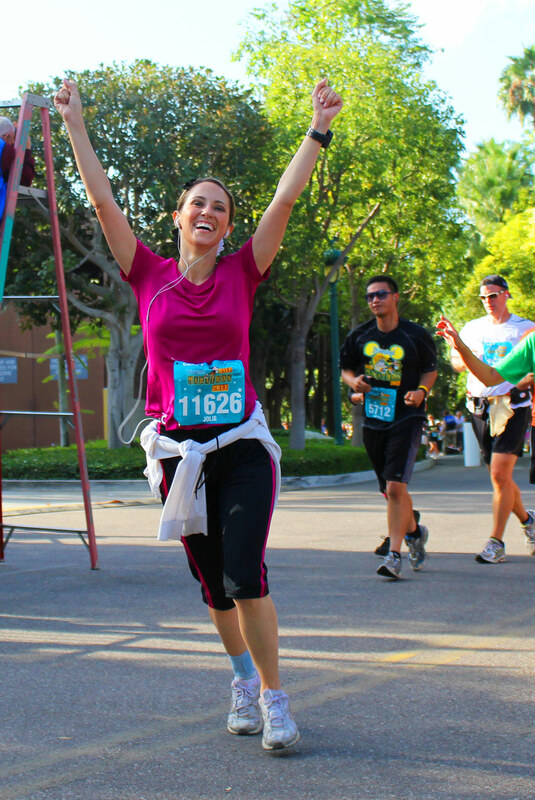 RunDisney even featured a shot of me crossing the finish line on their Twitter account for National Running Day, which I didn't know existed, but was happy to learn about. I was surprised when RunDisney tweeted this picture of me on National Running Day. Anna in action! This picture makes it look like I won the race, which I did not. I mean, psh. Of course I did. 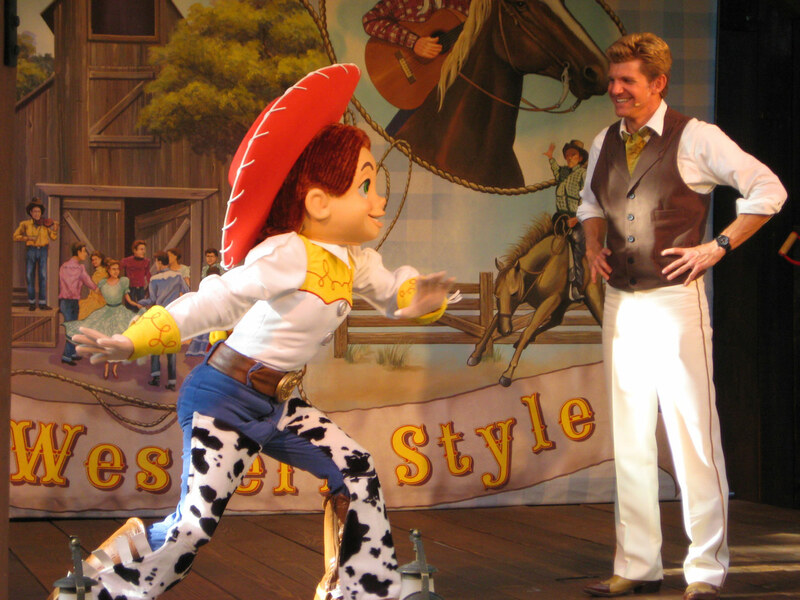 Anyone who knows me well, knows that Jessie from Toy Story holds a special place in my heart, since I was... shall we say... very well acquainted with her during the first few years I worked at Disneyland. Not to mention I love her tough n' tumble tomboy attitude. I may or may not be hiding in this picture somewhere. 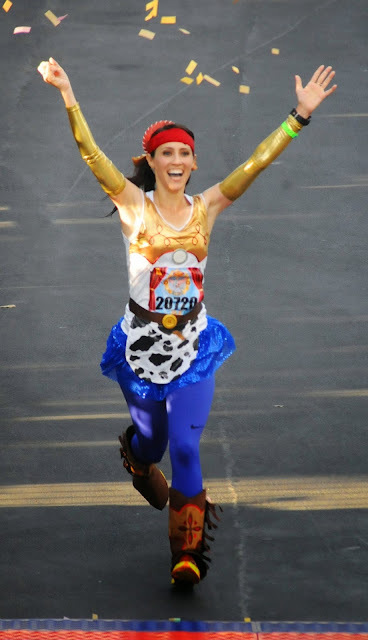 So I wanted my first custom-made running costume to be inspired by her. For this one, I started with a white tech tank, then hand-stitched gold material and red trim to the front. Instead of cowhide chaps, I went with a cowhide apron, and added blue capris and (*shocker*) a blue sparkle skirt. 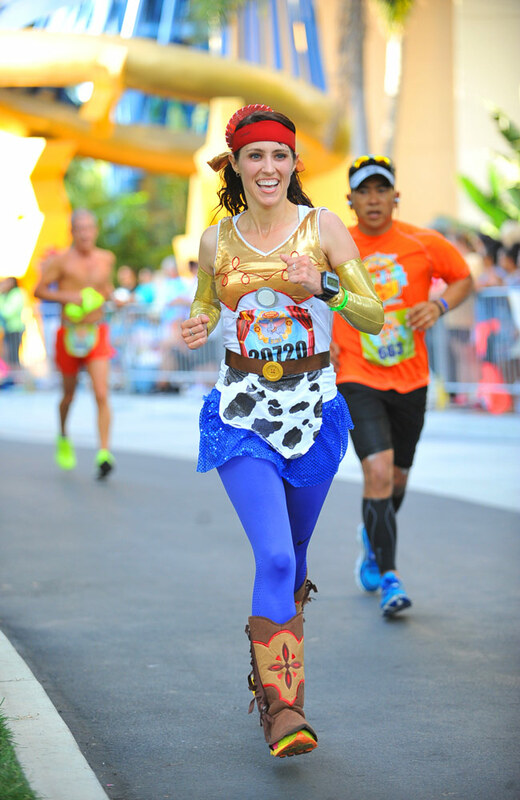 I went with gold sparkle sleeves instead of yellow cuffs, and tried to glue a small painted cowgirl hat to some hair clips, but it barely stayed clipped to my hair and 60% of the paint had chipped off by the time I hit the finish line. This was a special race for me because I sang the National Anthem at the beginning, hopped off stage and stripped off my overdressings to reveal the Jessie costume beneath, and started the race a minute later. 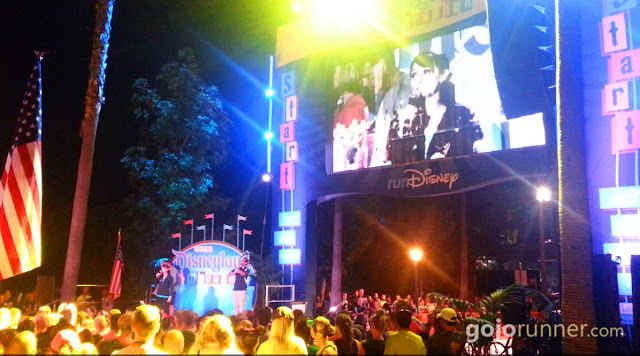 I sang the National Anthem before running the race. They wouldn't let me strip on stage for some reason. 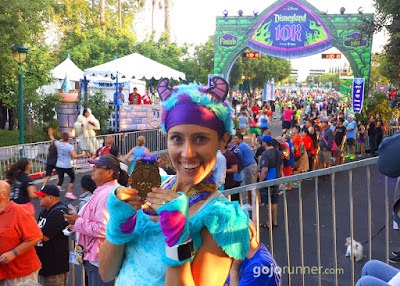 So if you ran the Disneyland Half Marathon in 2013 -- that girl who sang the National Anthem was me! Unless you thought it sucked. Then it was someone else. And let's be honest -- if you remember how the National Anthem sounded at the 2013 Disneyland Half Marathon, then it really sucked. My family and buddy Greg were there to run with me, and it was my sister's birthday. Happy birthday, sis! Running the 10K with my Dad. 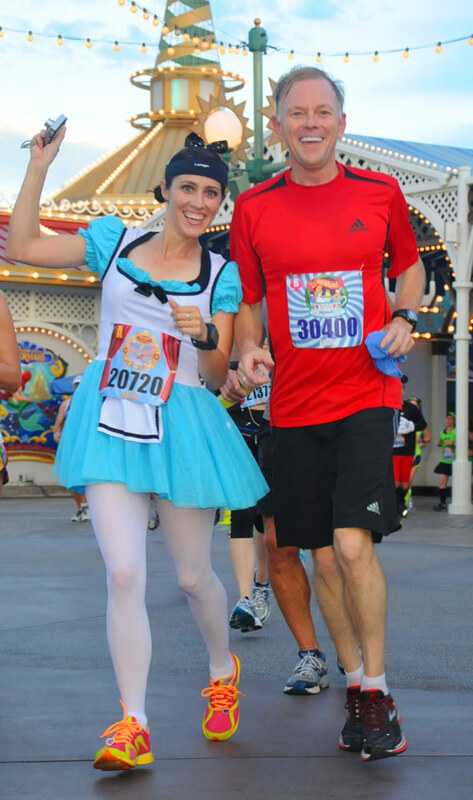 I originally wasn't planning to dress up for this race (I was putting all my energy into my Jessie costume for the half), but my friend Lisa said she had an Alice dress I could borrow if I wanted to run the 10K in that. 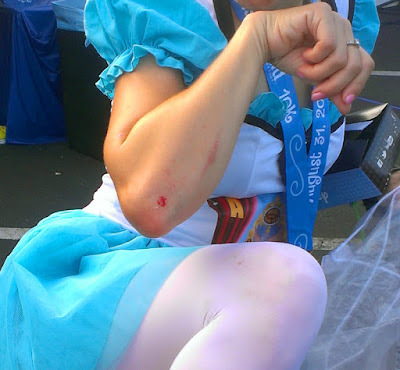 So at the last minute, I bought a pair of white tights and threw on the Alice dress. Clearly I was a race cos-player in training. My family was there running the Dumbo Double Dare with me, though they didn't opt for mad hatter or white rabbit costumes. Dad, me, my sister Christy, and our friend Greg. The highlight of the race was tripping on a road reflector around mile 2, where I smacked the ground and barrel rolled back up a second later, somehow continuing my pace without slowing down. People around me screamed when I hit, and then looked at me in confusion when I popped back up in a continued run. "I think you actually gained ground with that move," a guy next to me said. I always knew those Nerf gun wars with my friends would pay off. Though I didn't come away unscathed. But the dress did, which is what really matters. With my third race ever, I finally thought about what I was going to wear before I got out of bed that morning. 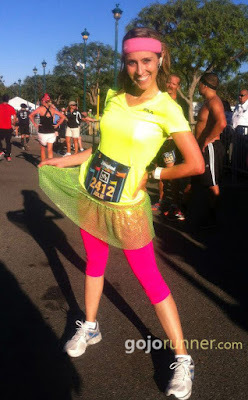 Not too impressive an outfit for a Disney race, but bright and cheerful, nonetheless. 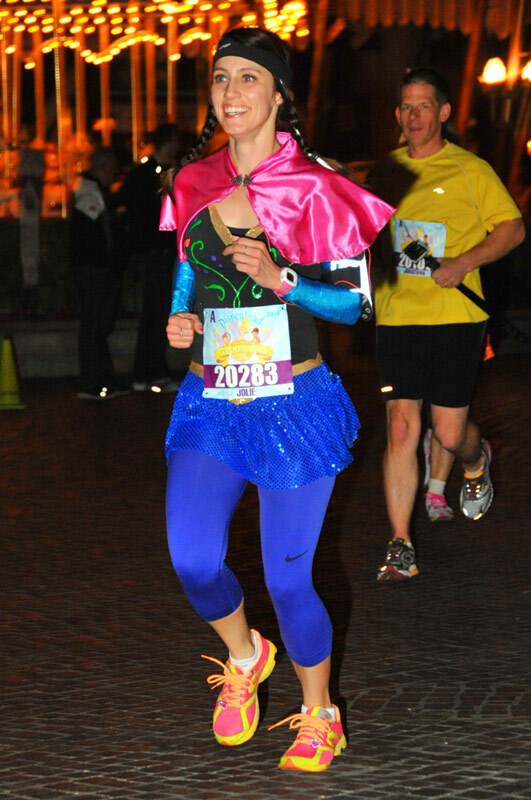 I always recommend sparkle skirts to anyone running a Disney race, or any race for that matter, because it adds extra bling without extra drag. Ok, so I came close to being visually ok for this race. I say "came close," because I did purchase my first sparkle skirt for this race -- my 2nd race ever -- but then, I committed a cardinal sin. I. Tucked. My. Shirt. Into. My. Skirt. Nothing says "fashion" like a black elastic waistband. Nothing says "newbie" like a shirt/skirt tuck. Fashion has never been my natural forte, which my stylish sister can attest to. I often prefer comfort over cuteness, but I doubt this tuck-job was comfortable either, so who knows what my problem was. 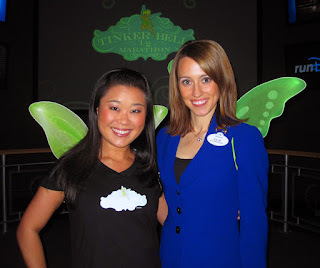 With my friend Lisa at the Tinker Bell Half Marathon press announcement, where I got the wings. I think I said "no" in a bit more magical way, but my thought was no, nonetheless. 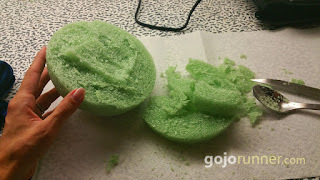 I had just trained and run my first half marathon ever, with no plans to revisit such a race again. Until my co-Ambassador friend signed me up for this one without me knowing. 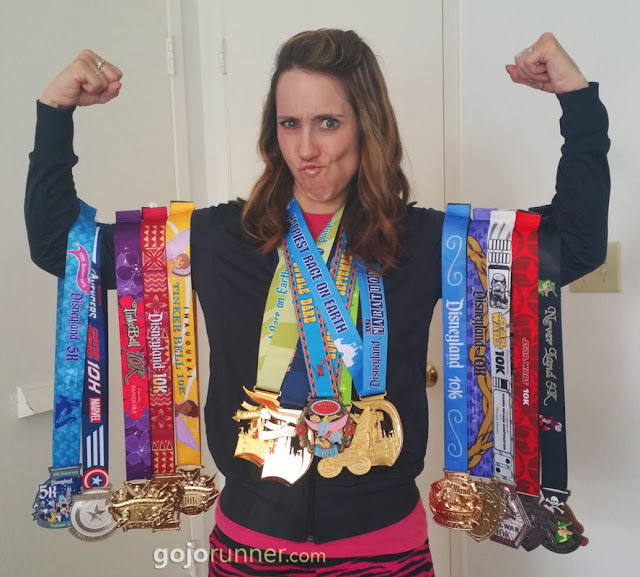 I guess I really owe it to that friend, because after signing me up for three Disney Half Marathons in a row, by the time the third one was complete, running was now a part of my lifestyle. Now someone just needs to sign me up for New York Fashion Week every year. 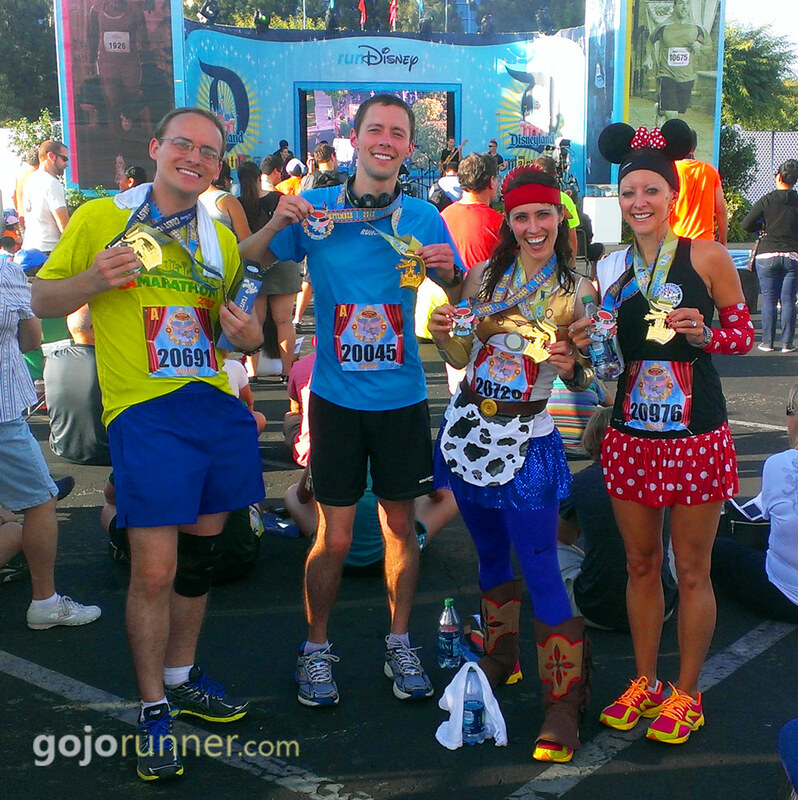 Some Disney friends helped me at least get a tech shirt and sport capris for the race, since I think I did all my training in cotton t-shirts and basketball shorts. 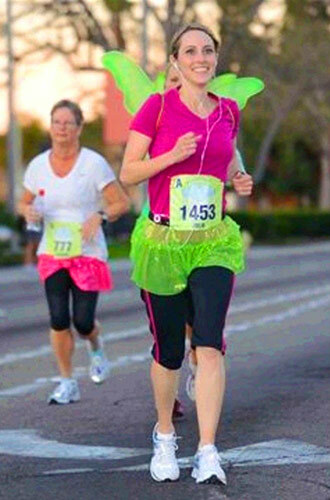 But low and behold -- It's the same outfit I wore for the next Tinker Bell! Except for the wings and skirt. Evidently I had a true shortage of appropriate sport apparel in my closet, and no pair of tennis shoes younger than six years old. Then, just in case anyone doubted that I had no idea what I was doing, I tied a cotton sweater around my waist "in case I got cold." This is where a teacher gives me a "most improved" certificate, to which I scratch my head and try to decide if that's an insult or a compliment. Keep the material lightweight -- you don't want to add 71 minutes to your 5K time because you insist on getting the fur right. "Inspired by" is good enough. Slap on a pair of mouse ears and you can be Mickey, or get as detailed as you want. If you've never sewn before, who cares? Grab a needle and thread and see what happens when you put it to fabric. No one is going to be looking at your stitching come race day. 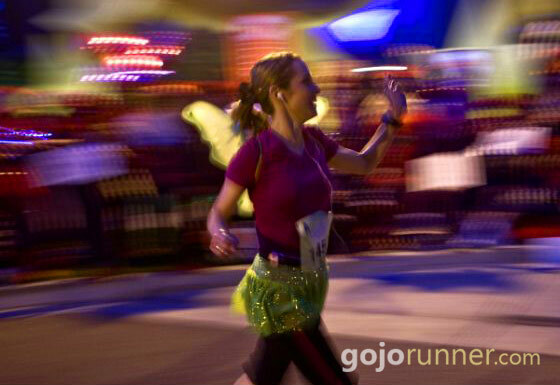 Safety pin loose costume pieces together once you put the costume on when race day comes. Otherwise skirts might ride up, capes might twist, etc. If you want to go all out with the outfit, get shoe covers or matching shoes. 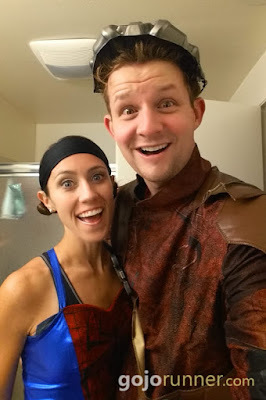 Test out your costume before running the race in it -- people might think you're a weirdo when you're running through the neighborhood dressed like Tigger, but it's better than stepping on the course and not being able to bend your elbows, or you get chaffed, or worse -- lose the costume completely. 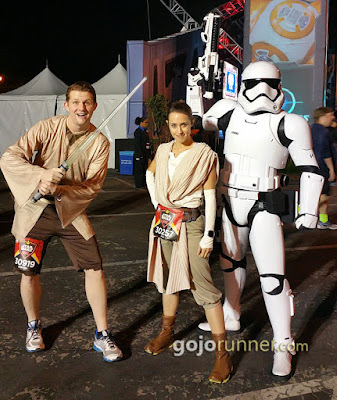 Check race costume rules before you design yours -- I knew a disappointed Death Star when RunDisney's new policies were released early this year. Don't. Tuck. Your. Shirt. Into. Your. Skirt.